You will fall in love with this ground floor, gulf front unit at Adagio. Enjoy the beautiful white sandy beaches and emerald water on the highest point on the gulf in Blue Mountain Beach. This 2,200 square foot unit is located close to the infinity edge gulf front pool and offers plenty of privacy and a patch of grass directly off the patio for the kids to play! The gourmet kitchen is stocked with everything you need to prepare a home cooked meal. Or, enjoy many of the great restaurants 30A has to offer. 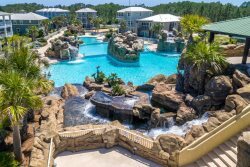 Adagio is located minutes from Seaside, Watercolor, and Grayton Beach. A 25% deposit of the total rate holds the unit for you and is applied toward your rental fee. Add $240 for housekeeping and 11% for tax. There is a $69 damage protection fee, $30 Booking Fee and 2.50% to process credit card payments.